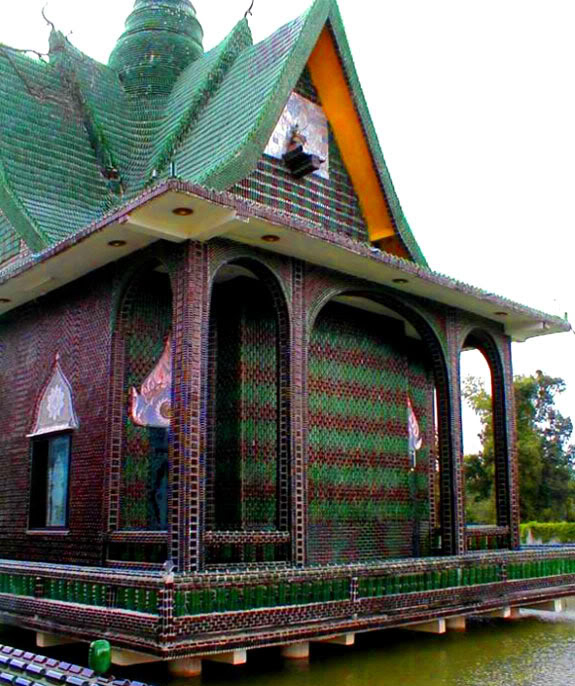 The Beer Bottle Temple at Khun Han close tothe combodian border which also goes to the name of " The Temple of Million Bottles" or "Wat Pa Maha Chedi Kaew" to give it its correct name is an environmentalist's dream . The temple is located in the remote North-eastern province of Sisaket ,around 650 kms(400 miles) from the Thailand capital of Bangkok . 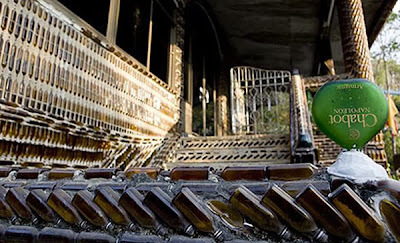 Less than forty years ago, the manufacturers of Heineken beer and designer John Habraken, had attempted to erect a building using Heineken beer bottles and Volkswagen bus tops. Unfortunately, this project was scrapped. 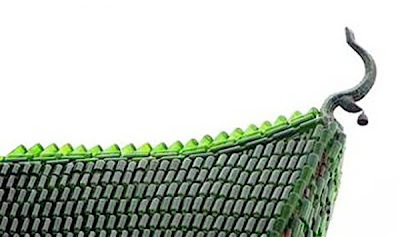 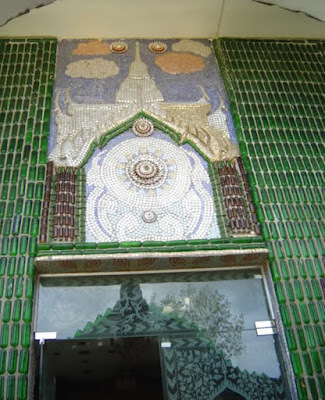 It is quite interesting to note, therefore, that the Beer Bottle Temple in Thailand was made mostly of Chang (Thai Beer) and Heineken bottles – giving the temple it’s distinctly contrasting green and brown colors. 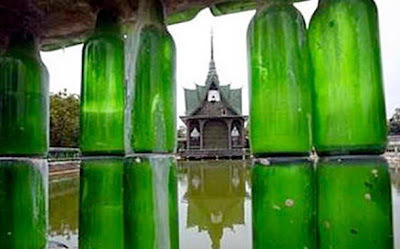 The eco-friendly Theravada Buddhist monks of Wat Pa Maha Chedi Kaew had started collecting beer bottles around 1984. 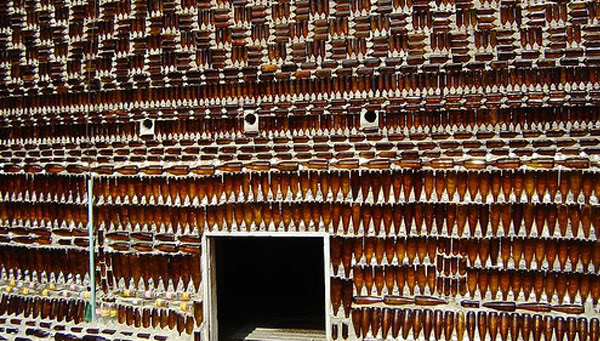 Back then, the bottles were only used for making decorations. 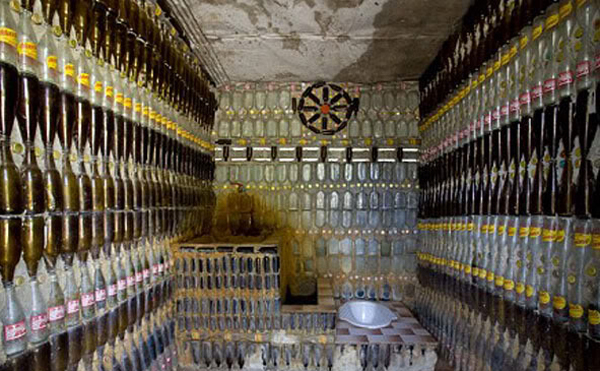 Rumor has it that a monk had tired of seeing all the litter around the local countryside, so he encouraged the locals to bring their empty bottles to him and his acolytes for recycling. Over the years, the quantity of the bottles being donated to them increased considerably, so they decided to start using the bottles as a building material. 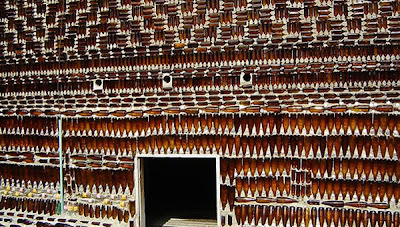 Whole bottles were set in concrete, to strengthen the buildings. 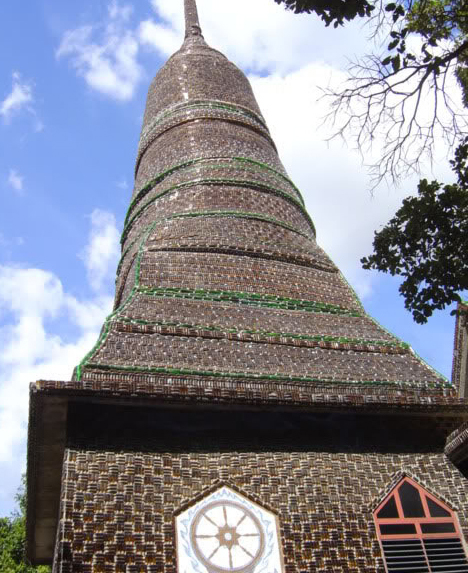 With the help of local community, the monks had been able to build their beautiful temple of beer bottles. 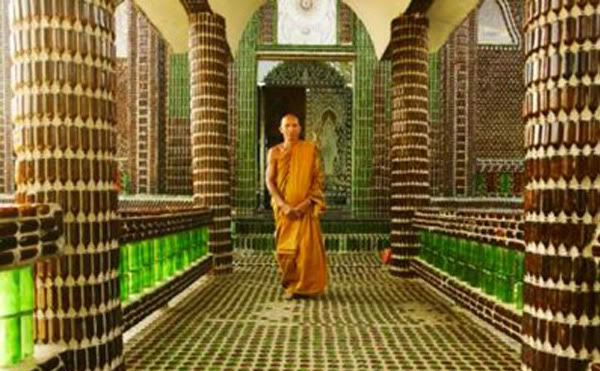 To date the beer bottle temple monks have been able to build a complex of some 20 buildings in total, made almost entirely of beer bottles. 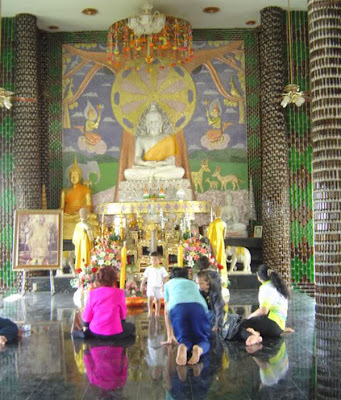 The complex includes prayer rooms, a crematorium, a water tower, tourist washrooms and the main temple. 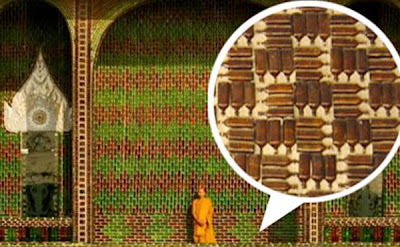 The intricately designed main temple sits over a lake. 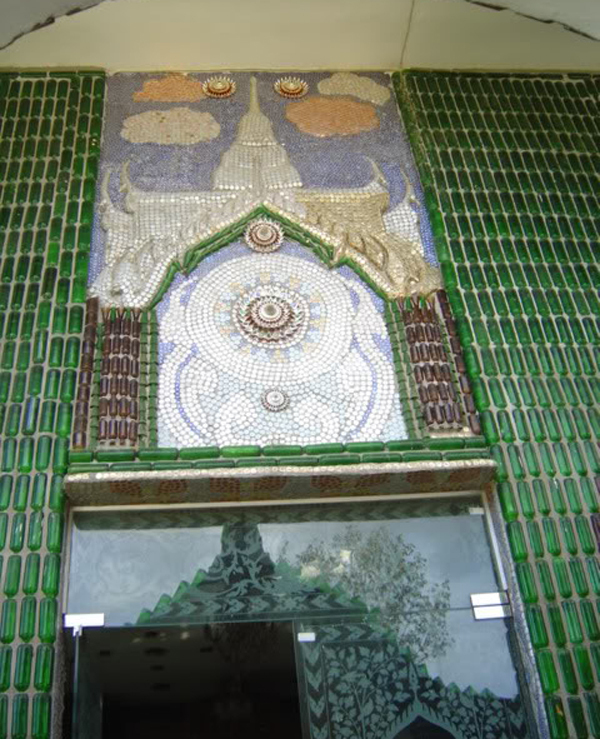 There are also several bungalows, which serve as the monks’ living quarters, inside the compound. 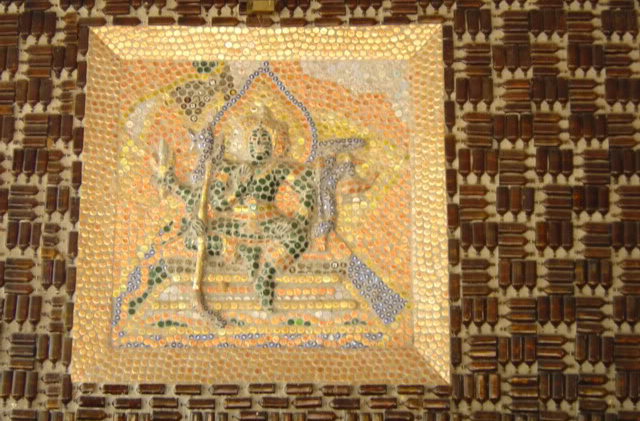 No trash is wasted here, as even the mosaics of Buddha are made of recycled bottle caps!.So far, an estimated 1.5 million beer bottles have been used!. 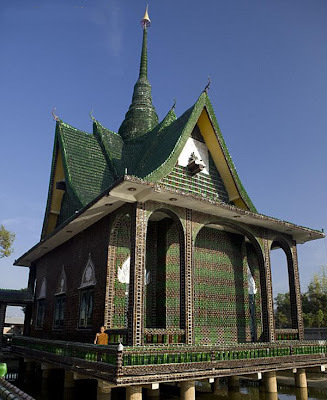 The local authorities also help the monks to get more bottle donations, so that more structures can be built. 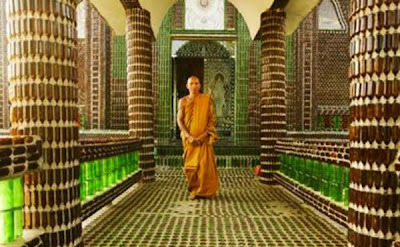 The monks absolutely approve the use of the bottles because they are easy to clean and provide great natural lighting for the buildings. 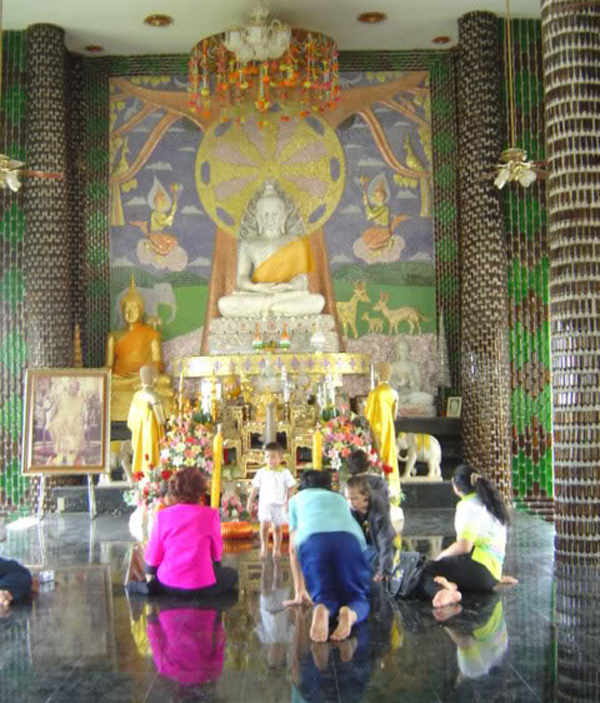 Wat Pa Maha Chedi Kaew is now an approved sight-seeing destination for eco-friendly tours around Southeast Asia, its well worth a visit, but not easy to find!.